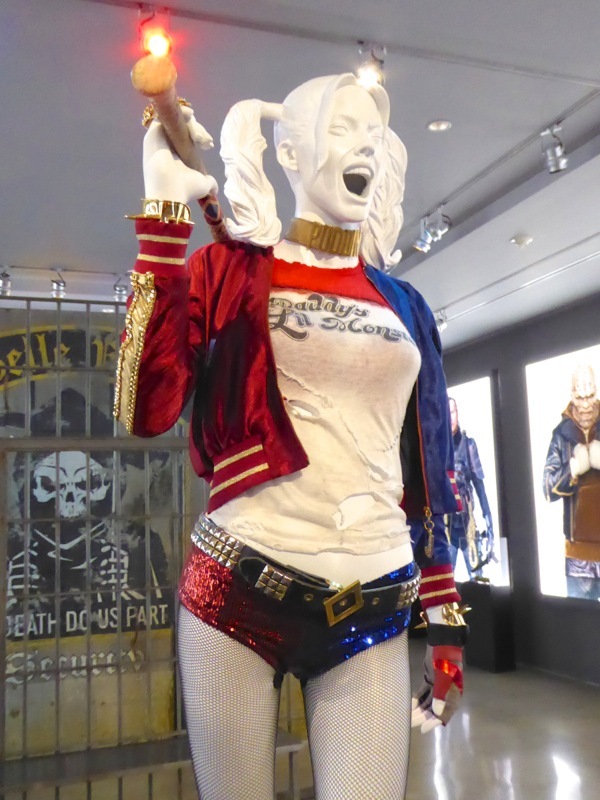 This Summer Margot Robbie brings one of DC Comics fan-favourite characters to life, as 'Harley Quinn' makes her debut on the big screen in the new Suicide Squad movie. 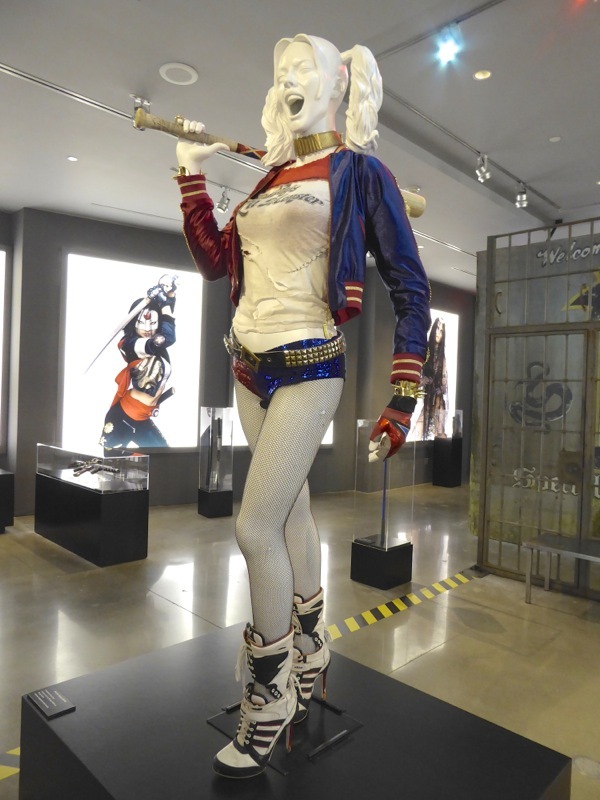 Here's a closer 360° look at her cinematic costume on display at the Warner Bros. VIP Studio Tour in Burbank, California on June 9, 2016. 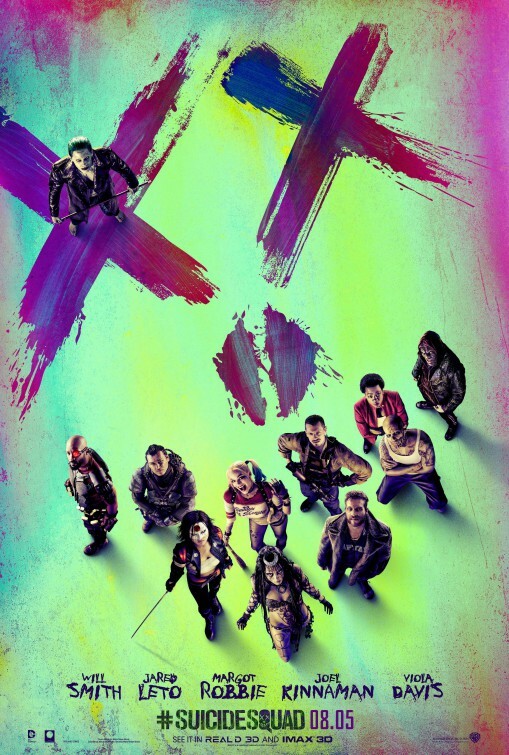 Kate Hawley was responsible for creating the look of The Joker's psychotic main squeeze for David Ayer's comic book movie, which sees a shadowy government organisation recruit the worst killers, criminals and mercenaries for a special black ops task force, the Suicide Squad. 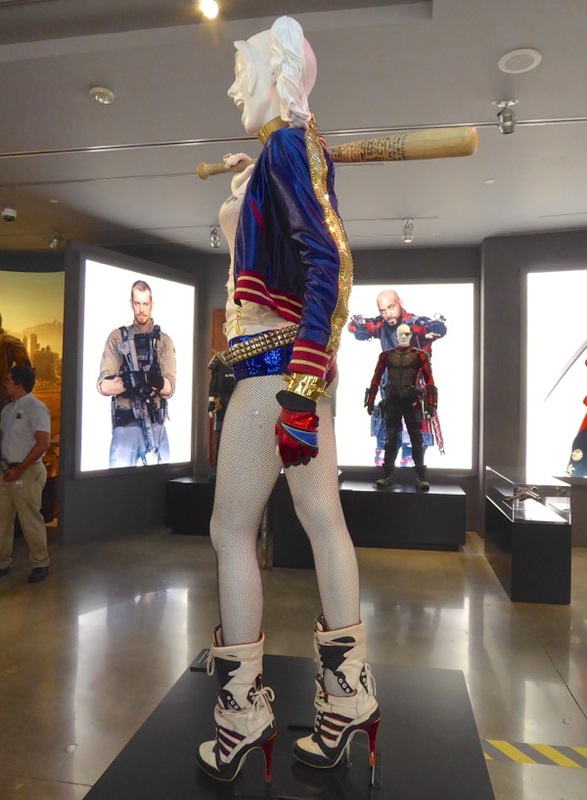 For more fantastic designs from Kate Hawley, be sure to also enjoy these gothic romantic Crimson Peak movie costumes on display at Downtown L.A.'s FIDM Museum earlier this Spring. 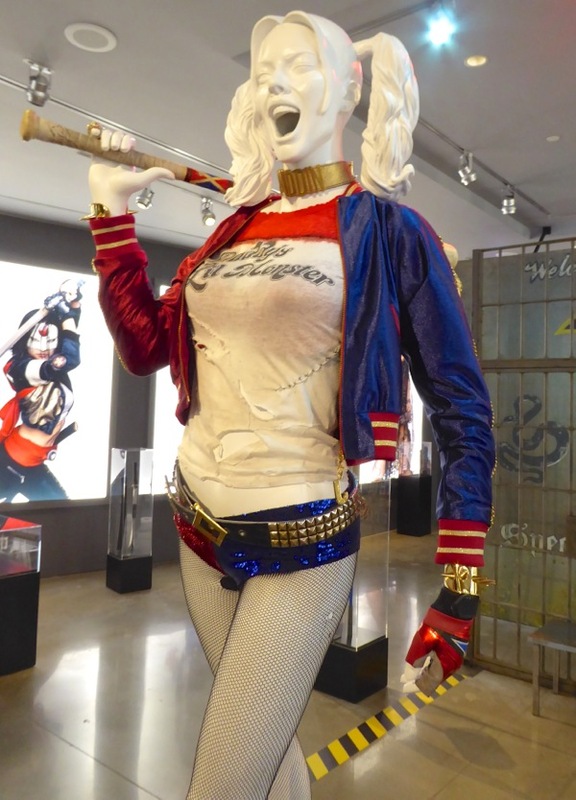 The DC character from Batman's rogues gallery was created in 1992 by Paul Dini and Bruce Timm for Batman: The Animated Series, and her mischievous name is a play on the historic 'Harlequin' characters. 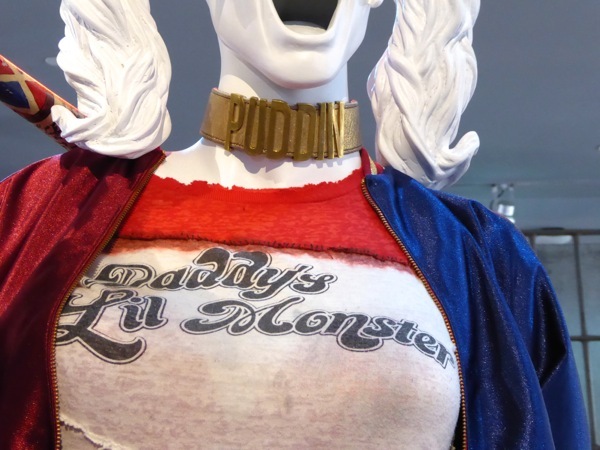 I've no doubt that this sexier new-look Harley Quinn, which is a radical departure from her jester-themed original costume, will be a Cosplay and Halloween favourite this year but don't forget her colourful ombré or dye-dipped blue and pink hair, and her heart-shaped tattoo on her right cheek, to help complete the look. 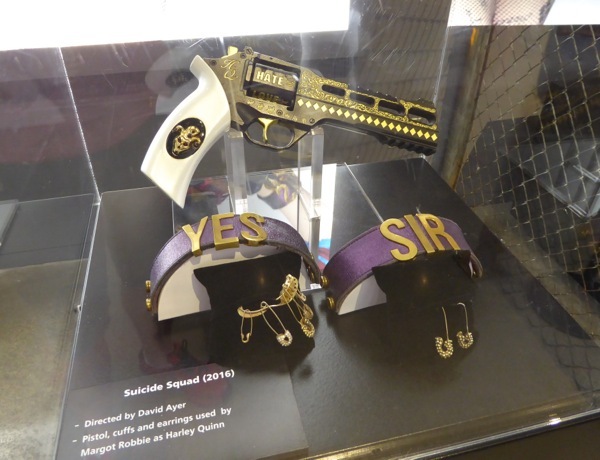 Here's also some of the props Margot Robbie uses in the movie to bring the villainous character to life, her ornate pistol, some cuffs and earrings. 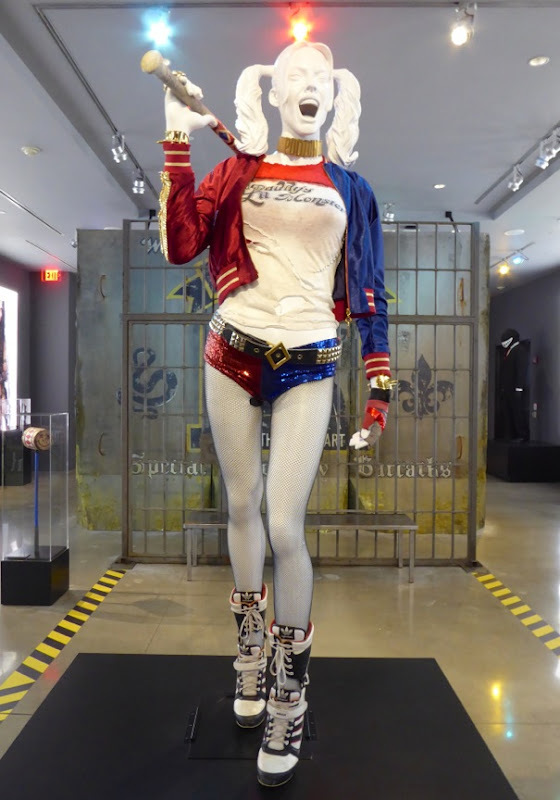 This fabulous costume was part of the DC Universe: The Exhibit at Warner Bros. Studios VIP Tour Hollywood, so make sure to check it out in person this Summer if you are able, as there are so many amazing costumes and props to see. 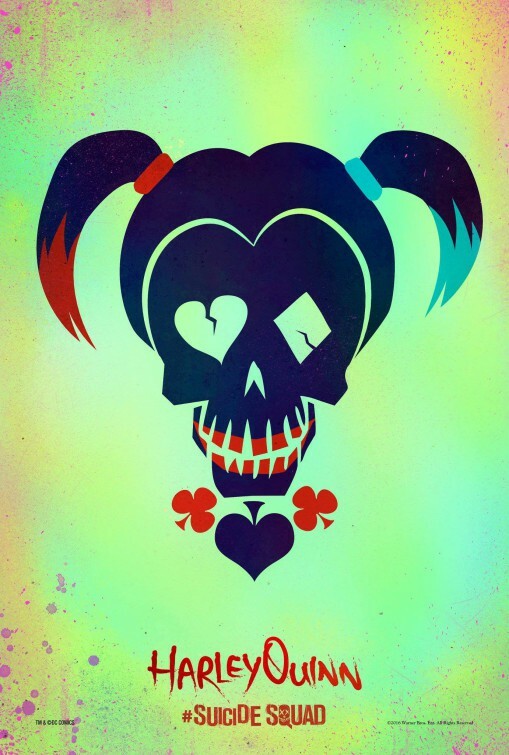 Now let the countdown begin to the Suicide Squad movie coming to cinema screens this August 5, 2016 in the U.S. 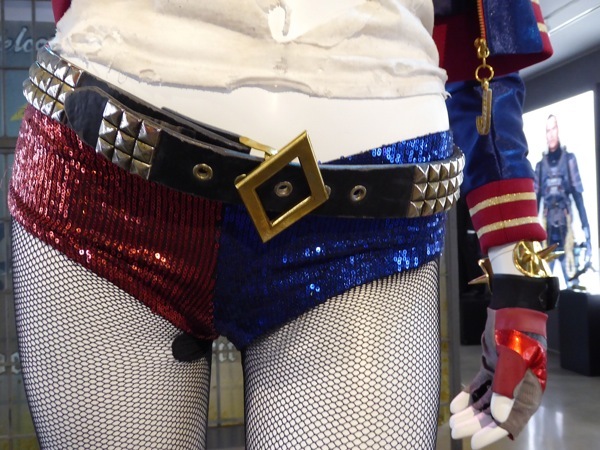 UPDATED: You can also see this Harley Quinn costume and more detail shots on display at ArcLight Hollywood cinema. 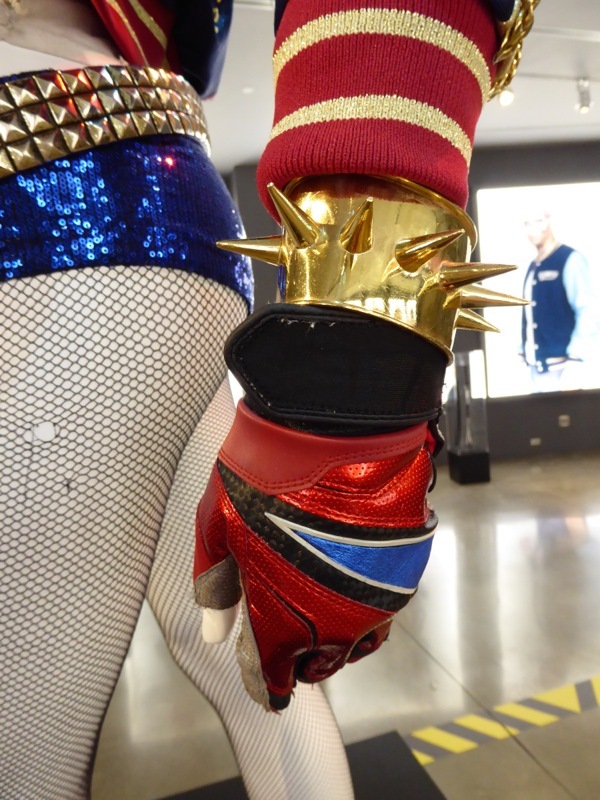 Could you post a close up image of the ring? 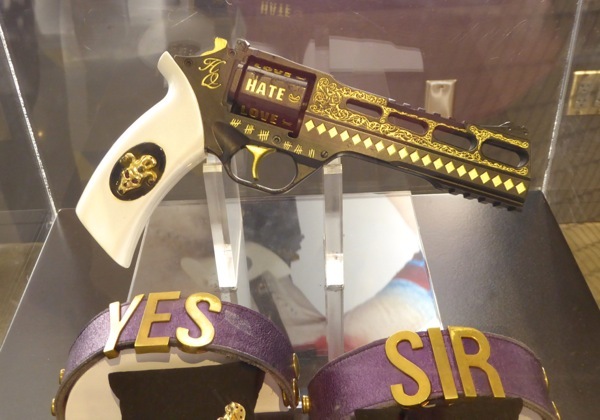 And possibly the bat? 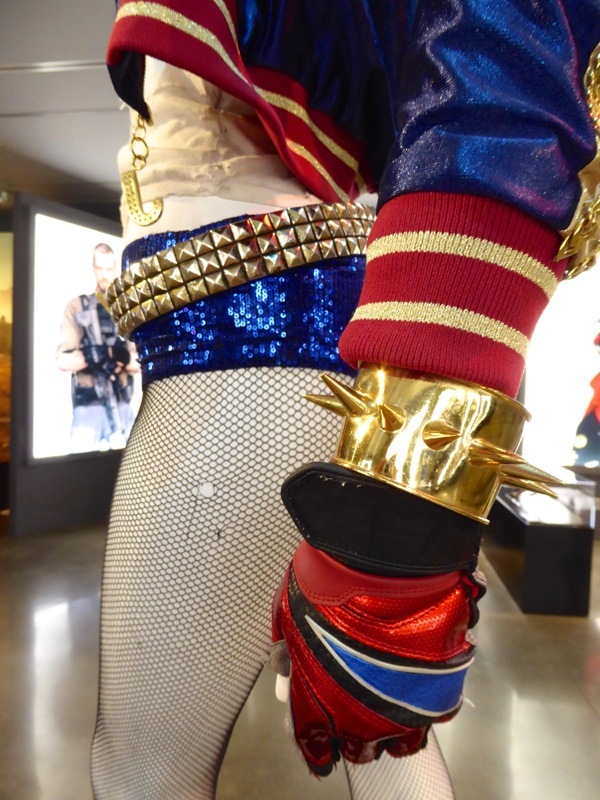 I've checked and I haven't got any clearer images of the ring I'm afraid. 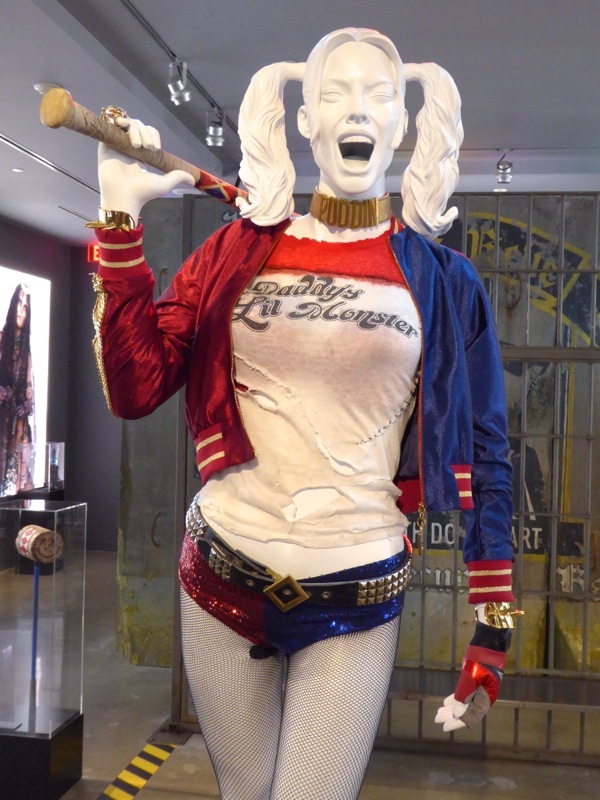 You can email me at jasoninhollywood@hotmail.com for details on how to get hold of high res images! 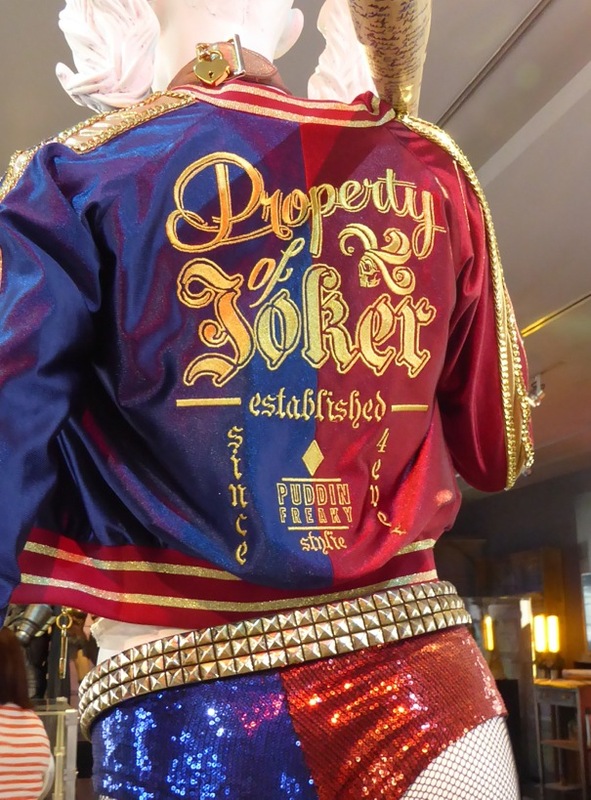 I've added a close-up of the back for you and others who've requested - I think it looks embroidered. They look engraved to me, but I'm not 100% sure! Yes it is a raised gold chain trim! 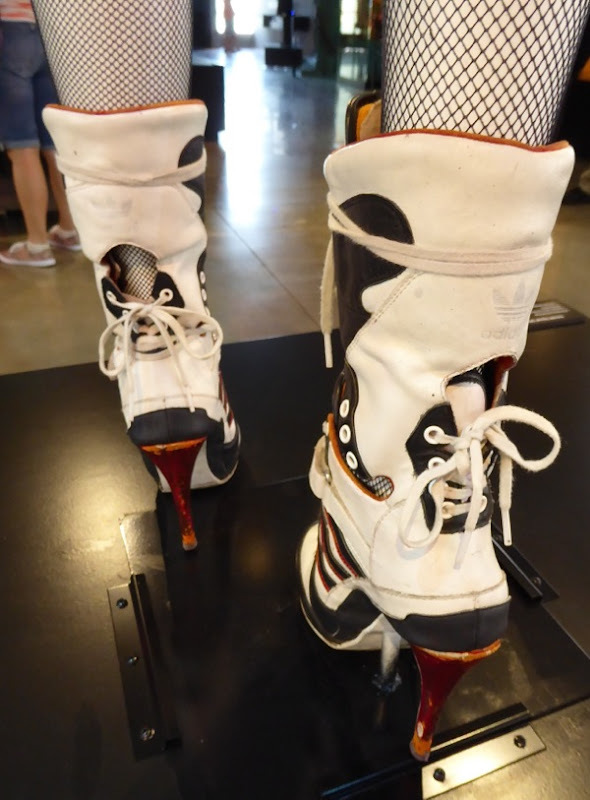 please can you say where i can buy harley's heels? Do you have closeup images of her earrings? just added another earrings image, hope it helps! 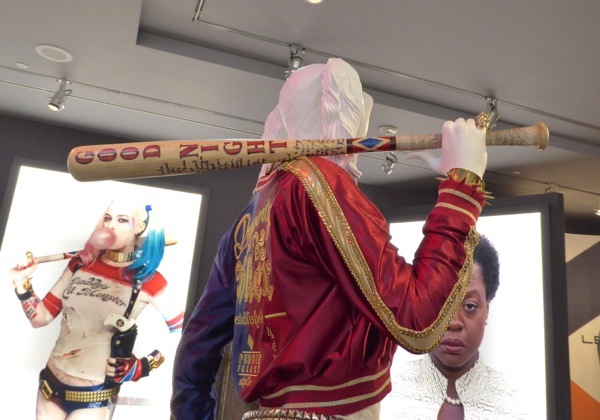 What are the small words on her bat?